The Jade Rabbit and its iconic design, most notably the Jade Jester ornament, is one of the most intriguing designs in all of Destiny 2 (and D1). My painting of the Jade Rabbit/Jade Jester ornament - optimized for 19x13” print. 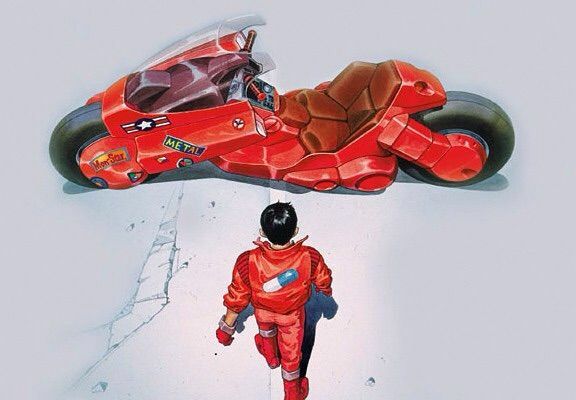 The nod to Akira and the decoration style of Kaneda’s custom motorcycle is a fairly clear. It’s reminiscent of late 80’s early 90’s anime with a cyber punk lean. My version replaces the in-game decals with graffiti, my own logos, references to my play style (Hunter main, baby) and a nod to Akira and my favorite anime of all time, FLCL (which, side note, was also the icon used for the clan I have been a part of since joining in on Destiny on PS4 in 2015). The suggestions that Destiny makes, time and again, to it existing in the future of our world, is something that few post-apocalyptic settings do well. Either its a huge effort and a long reach to get there, or it’s just ignored in favor of development of other kinds of story, game play, game modes, etc. A full view of the finished 42x36” painting. Sketched from reference in Destiny Companion app, then traced and straightened with ruler and light box. First layers of canvas used for Jade Rabbit painting. 42x36”. First fill layers for Jade Rabbit. First fill with detail outline. This is the rough fill of the “Kaneda” details. Probably about 3-4 versions in. Still has a lot of bad fills and rough edges. The overall process was fairly simple. Using in game screen caps, as well as a preview from the Destiny Companion app, I was able to isolate and get a full profile view of the Jade Rabbit. From there, I made a rough sketch that I then scanned, scaled up, printed and traced- this time using a ruler to straighten out and conform/balance the source sketch. At this point, it’s still rough because just the outline needs to go onto the canvas. I have a lightbox projector thing that, tbh, just isn’t super bright or easy to use. But in a dark enough room, it works decently if I’m patient. Once the outline is on the painting surface, it’s a lot easier. I mixed up some bubblegum pink paint that would run and drip. I used some additional collage layers and stickers to get the right details on the canvas. And then I used transfer paper to get finer and finer details, and to add better outlines for fills (especially on that text). The symbols I chose to modify or include push the references closer to the motorcycle in Akira. Obviously, the original design is reminiscent of several cyber punk and anime designs, and it smacks of American and UK punk culture. But I couldn’t not see the connection to Akira. Destiny has a rich lore. Period. It’s one of the reasons it’s my favorite game. The new lore and triumph screens really turn this into the experience I’ve always wanted (you hear that, EA? You hear that, Bioware? Go back to the level of production in the original Mass Effect, please!). The depth and intricate web of story from a game that is essentially non-linear in its storytelling is fantastic… even if the story itself that your Guardian lives through is not always the most compelling narrative. How many engrams do you think it would take to hold my favorite anime films, TV shows, related American spin-offs, and manga? Just one, probably, right?